First few shots showing something I'm starting to think is going in the right direction. I've had several false starts and after a few failed tries picked a different version of the map entirely because the ground texture placements were easier to manipulate. I'm playing about with some new ideas in this map. Crops are a priority as are woods of a specific type. I'm part way to getting a different look for ancient deciduous forest, silver birch themed light woods and coniferous woods. 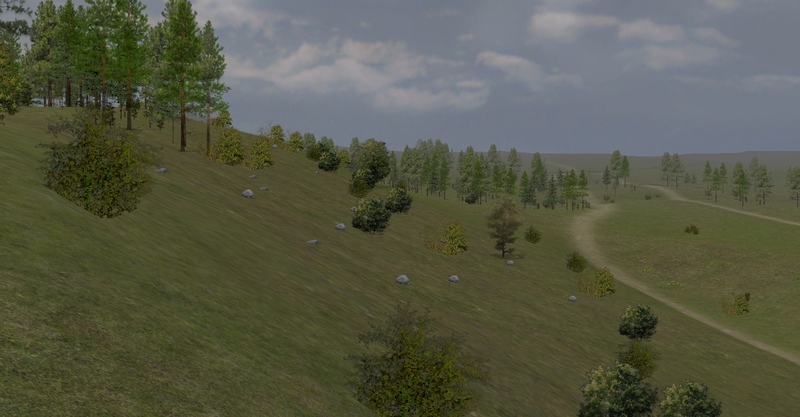 Also experimenting with showing steep slopes that will tire, slow and disorder troops as well as rough ground unfriendly to cavalry. Also marshes! Do not enter! No buildings put in yet except placeholders for villages and farms. The map is turning into a bit of a pastiche of hilly rural Germany. It has a Black Forest feel with the pinewoods and a Moselle valley feel with the vineyards. I think its more or less getting to the right atmosphere I want though. Fun with crops. Main field is rye. Background is wheat. Left foreground using the tobacco plants is what I think of as potatoes. Trying out some poplars along the roadsides as well in the left background. Pine forest. I've messed about with the tree mix since this pic and made the woods denser all round. An early attempt at depicting the denser bushes and other ground cover at the perimeter of woods where sunlight encourages more growth. Not sure its working yet but will persevere. Marsh. Do not enter except on roads! 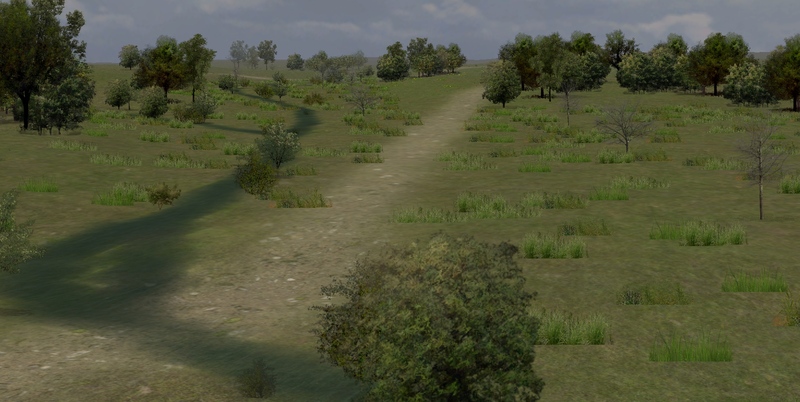 First try at depicting a steep slope unfriendly to all troop movements. 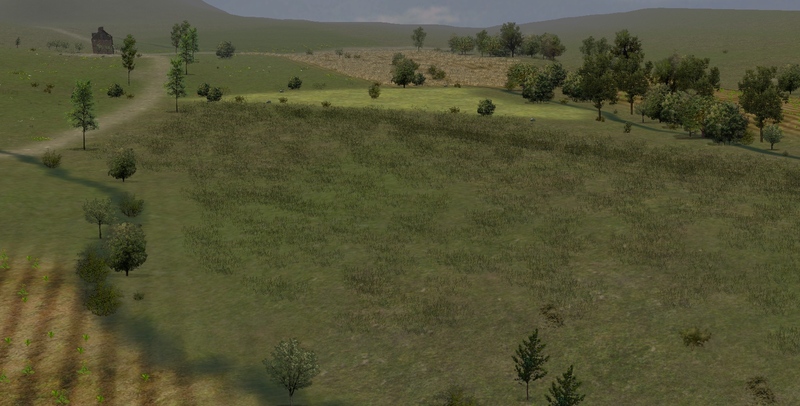 On this map rocks mean bad news, especially to cavalry.